Note on methodology: This is consistent with the approach I’ve used in the previous two trackers. As I’m including the polls over the two weeks before and the two weeks after each leader’s 3, 6, 9 and 12-month marks, I’ve updated the previously published 6-month numbers with the later polls – which increased them slightly. As this post has come nearly two weeks after the 9-month mark, there may not be any further change to the latest number. Data’s from Mark Pack’s brilliant sheet of all post-war voting-intent polls and Opinion Bee (which is new to me but has an excellent database). This entry was posted on Saturday, June 25th, 2016 at 11:02	and is filed under Labour leadership, Politics. You can follow any responses to this entry through the RSS 2.0 feed. Both comments and pings are currently closed. A lot of Labour’s core vote has been eroded over the last 1-2 decades by devolution. So comparing to any previous situation is simply an unfair comparison. People realise the unions no longer have so much of a say in political affairs and instead of voting labour to be part of that block vote they are turning to local parties such as the SNP and Plaid Cymru more and more. Blair and Brown were both centre-right politicians, a realm of the political spectrum that people, especially those likely to vote Labour, are showing increasing disgruntlement with. Most of those challengers to Corbyn in his own party would take Labour back to that position and probably reduce their appeal. People are currently reeling from the referendum and trying to work out who’s doing and saying what and why so. Give it a week or two and I wouldn’t be surprised if Labour’s popularity surged when it becomes clear that the referendum will be ignored and Boris will be in number 10. I’ve never voted Labour in my life but Corbyn is the only person in Westminster I could find myself voting for if there were an election tomorrow. I’m sure I’m not the only person who feels that way and it probably explains why Labour party membership has doubled under his helmsmanship. It seems to me that the real comparison is +/- over starting point. Otherwise, you have a bias built in for people who became leaders when Labour, not necessarily thanks to them, was doing well and against those who became leaders when Labour was doing badly, again not necessarily thanks to them. 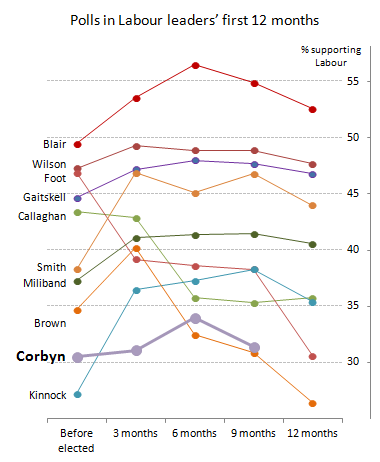 By that metric, it seems that Corbyn is not great but far from the worst. And a good comparison would be unpopular Tories in oppositon too. How many uk governments were Tory post war? How long were their terms? Though Thatch managed to survive she was succeeded by Major who won two terms before being removed in 97. In sum Tories have been in opposition as much as Labour. Also I think it’s bizarre that this has been carried out to discredit Jeremy Corbyn’s position. Thanks very much for the comments. The previous posts in the series (which I started as soon as Corbyn became leader – this isn’t something I’ve just started to highlight how he’s doing now) go a little more into the methodology: http://www.noiseofthecrowd.com/category/labour-leadership/. In short, this is the % that say they would vote Labour in published polls. I’ve taken the data from Mark Pack’s comprehensive spreadsheet of post-war polls. It doesn’t go as far back as when Attlee became Labour leader. I would like to include Tory leaders and will do so if I get time. Putting the data together carefully is quite a time-consuming job. I prioritised Labour leaders as it seemed the most relevant comparison.